Amazingly true predictions of love, attraction & happiness for Pisces. 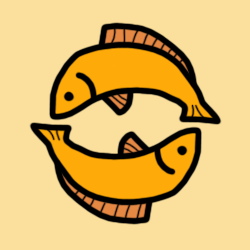 2019 Pisces Lovescope reveals a love and romance horoscope that points to a status quo in your romantic relationships and partnerships. This influence brings a more serious version of yourself, bringing more order to your life - particularly in responsibility and professional spheres. It does not mean there is nothing going on, but that relationship matters are not making headlines in your life now. The Pisces lovescope 2019 predictions are not just about love, romance, attraction and sexuality, but also enlighten us of things that you enjoy and events that bring happiness to your heart. However, to truly relish the offers, please refer Pisces 2019 Horoscope for the overall scheme of planets impacting you, and Ephemeris and Astrological Calendar, 2019 for exact dates and times. The influences arrive early for Pisces natives born early, in the 1st Decan (Feb 19 - Feb 29). Those who are born later, in the 2nd Decan (Mar 1 - Mar 10) and 3rd Decan (Mar 11 - Mar 20), would experience the influences delayed and somewhat differently, as presented in the lovescopes below. Our yearly lovescopes are divided into 3 distinct Pisces decans. To know more about the Decans of Pisces, click here. If you find this confusing, please read only the 1st Decan for all Pisces 2019 lovescope predictions. Jupiter this year continues to point to a status quo in your romantic relationships and partnerships - until 2nd December 2019. From then onwards, Jupiter brings a general feeling of ease with others, helping you to minimize daily stresses - for the rest of the year. Saturn this year reviews your friendships, group and community involvements, personal dreams, ideals and perspectives, with tests and challenges that strengthen the foundation in these areas - throughout the year. Uranus this year continues to rebel you against strictures, to pursue opportunities in personal finance and value system - until 6th March 2019. From then onwards, Uranus makes you rebel against strictures, to strive for better interactions and work-life balance - for the rest of the year. Solar Eclipse on 6th January marks a new beginning or revised approach towards your friendships, or path to happiness and fulfillment; and Solar Eclipse on 2nd July marks a new beginning or revised approach towards love and romance, children, fun and leisure, or creative projects; and Lunar Eclipse on 16th July brings into light surprises or disclosures surrounding long-term goals, friendships, and group affiliations. Finally, Solar Eclipse on 26th December marks a new beginning or revised approach towards your friendships, or path to happiness and fulfillment. Also, the North Node continues to bring joy and opportunities through your playful expressions, and a real need to stand out from the crowd - throughout the year. 21st August - 23rd September is perhaps the most romantic time of the year, when you love and you are loved. You steal the show and also the hearts of your loved ones. For the eligible singles, marriage or engagement is certainly on the cards. Jupiter this year points to a status quo in your romantic relationships and partnerships. This influence brings a more serious version of yourself, bringing more order to your life - particularly in responsibility and professional spheres. It does not mean there is nothing going on, but that relationship matters are not making headlines in your life now - throughout the year. Uranus this year revolutionizes your value system and attitude towards personal finances, while you pursue wonderful opportunities - throughout the year. Solar Eclipse on 6th January marks a new beginning or revised approach towards your friendships, or path to happiness and fulfillment; and Lunar Eclipse on 21st January brings into light surprises or disclosures surrounding a romantic partner, or child, or a creative project; and Solar Eclipse on 2nd July marks a new beginning or revised approach towards love and romance, children, fun and leisure, or creative projects; and Lunar Eclipse on 16th July brings into light surprises or disclosures surrounding long-term goals, friendships, and group affiliations. Also, the North Node continues to bring joy and opportunities through your playful expressions, and a real need to stand out from the crowd - until 28th November 2019, after which the North Node brings joy and opportunities through home and family, and a real need to get your domestic life into order - for the rest of the year. 29th August - 22nd September is perhaps the most romantic time of the year, when you love and you are loved. You steal the show and also the hearts of your loved ones. For the eligible singles, marriage or engagement is certainly on the cards. Jupiter this year continues to not impact your partnership and romance spheres, but it helps to soften and encourage you - until 14th February 2019. From then onwards, Jupiter points to a status quo in your romantic relationships and partnerships - until 6th June 2019. Jupiter does not impact your partnership and romance spheres, but it helps to soften and encourage you - from 6th June 2019 to 13th October 2019. From then onwards, Jupiter points to a status quo in your romantic relationships and partnerships - for the rest of the year. Saturn this year continues to streamline your career, business, professional goals and objectives, ambition, reputation, and public life - until 4th April 2019. From then onwards, Saturn inspects your friendships, group and community involvements, personal dreams, ideals and perspectives - until 25th May 2019. Saturn finalizes your career, business, professional goals and objectives, ambition, reputation, and public life from 25th May 2019 to 19th December 2019. From then onwards, Saturn reviews your friendships, group and community involvements, personal dreams, ideals and perspectives - for the rest of the year. Eclipses bring drama and change, either in the physical world or inside your head. During January 2019, Solar Eclipse on 6th January marks a new beginning or revised approach towards your career, professional goals, or public responsibilities; and Lunar Eclipse on 21st January brings into light surprises or disclosures surrounding a romantic partner, or child, or a creative project. During July 2019, Solar Eclipse on 2nd July marks a new beginning or revised approach towards your domestic affairs, home, property, and family; and Lunar Eclipse on 16th July brings into light surprises or disclosures surrounding long-term goals, friendships, and group affiliations. Finally, Solar Eclipse on 26th December marks a new beginning or revised approach towards your career, professional goals, or public responsibilities. Also, the North Node continues to bring joy and opportunities through your playful expressions, and a real need to stand out from the crowd - until 24th May 2019, after which the North Node brings joy and opportunities through home and family, and a real need to get your domestic life into order - for the rest of the year. 6th September - 30th September is perhaps the most romantic time of the year, when you love and you are loved. You steal the show and also the hearts of your loved ones. For the eligible singles, marriage or engagement is certainly on the cards.